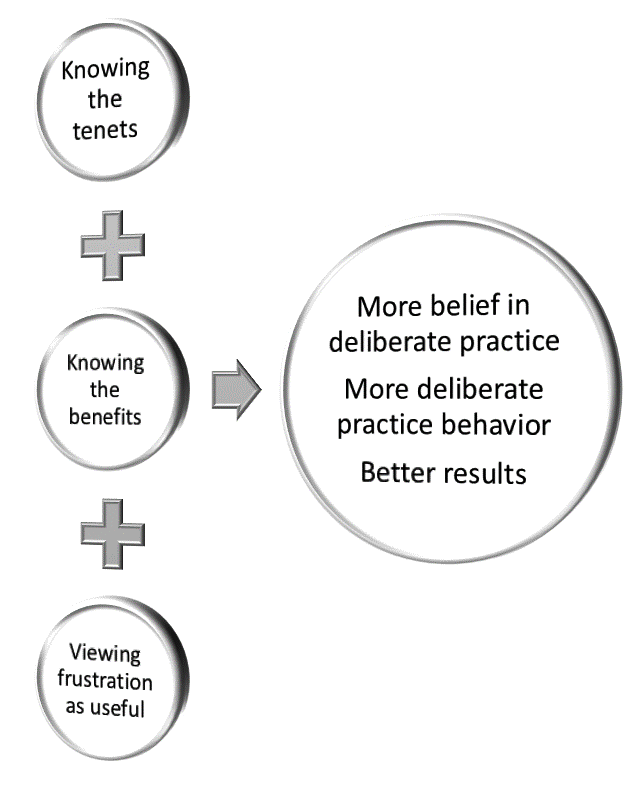 Top performers in all kinds of disciplines use the power of deliberate practice. They practice in a goal-focused way on challenging tasks, get immediate feedback and keep repeating until mistakes disappear from their performance. By doing this for many years, they keep breaking through performance limits and keep making progress. But deliberate practice does not only work for those who want to reach the top of their discipline. The approach works at witch ever level you happen to be. Unfortunately, many people fail to use and benefit from deliberate practice. In a new research project Eskreis-Winkler et al. (2016) have looked at how students can be motivated to use deliberate practice and how this impacted their performance. The research project consisted of 5 parts. First, a deliberate practice task was designed which consisted of a string of challenging math problems. The problems were offered to the students who participated in the study in such a way that each participant constantly remained challenged. The participants also got immediate feedback and were offered the opportunity to keep repeating what did not go right by being offered new comparable problems. In the first part of the project it was established that the task was the task was indeed suitable for deliberate practice and that the longer participants had practiced the better their performance became. What also was found was that the time which participants spend on deliberate practice was associated with their expectations. 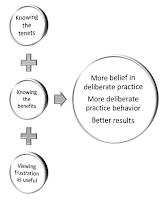 The more they believed in the usefulness of deliberate practice and the more frustration-tolerant they were, the longer they kept practicing and the better they performed. Then the researchers designed an intervention to stimulate the students to apply deliberate practice. The intervention consisted of an informative and a motivational part. In the informative part the students were told about the tenets of deliberate practice: (a) focus on weaknesses, (b) get feedback, concentrate 100%, and (4) repeat until mastery. In the motivational part they were told that the impact of effort on learning is often underestimated. Also, they were told that frustration and confusion should be interpreted as a sign that you are doing a useful practice task. The instruction was finished with a saying-is-believing-exercise in which they had to write a letter to another student in which they endorsed deliberate practice. The next four studies were done with students at different levels and in different classes. In all studies students who had had the intervention did better than students in the control group. They believed more in the usefulness of deliberate practice, they practiced longer, and their performance improved more. This simple intervention thus influenced their beliefs, their behavior, and their performance at all performance levels is was used. Deliberate practice is not only useful for those who want to reach the top of their game. It is useful for all of us. To use it we need knowledge about what it is, how it works, and what its benefits are. We also need good tasks for practicing in which we are offered challenge, feedback, and repetition. When all these conditions have been met, nothing stands in the way of benefiting from deliberate practice.